Come and stay with us at Ozark Adventist Academy, a place that is dedicated to providing a safe learning environment, in which students come to discover a love for God, respect for self, and the skills for fulfilled Christian living. At Ozark Adventist Academy it is our desire to learn to love and serve God more. 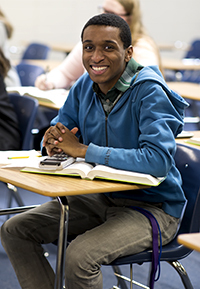 At Ozark Adventist Academy we are dedicated to providing academic excellence. At Ozark Adventist Academy you can develop friendships that could not only last a lifetime, but through eternity. Come discover what Ozark has to offer. A place where our teachers, staff, and students care and get to know everyone who attends our school. 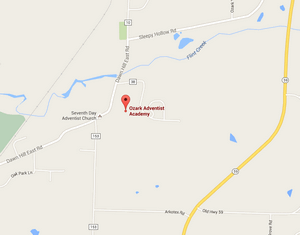 Our school is a haven located in the middle of the beautiful Ozark Mountains. You will not be lost here and you will have the opportunity to become a part of our Christian family. You will have the opportunity to pursue academic excellence and explore the Christian lifestyle offered at Ozark Adventist Academy . More than that, your life may be changed forever. 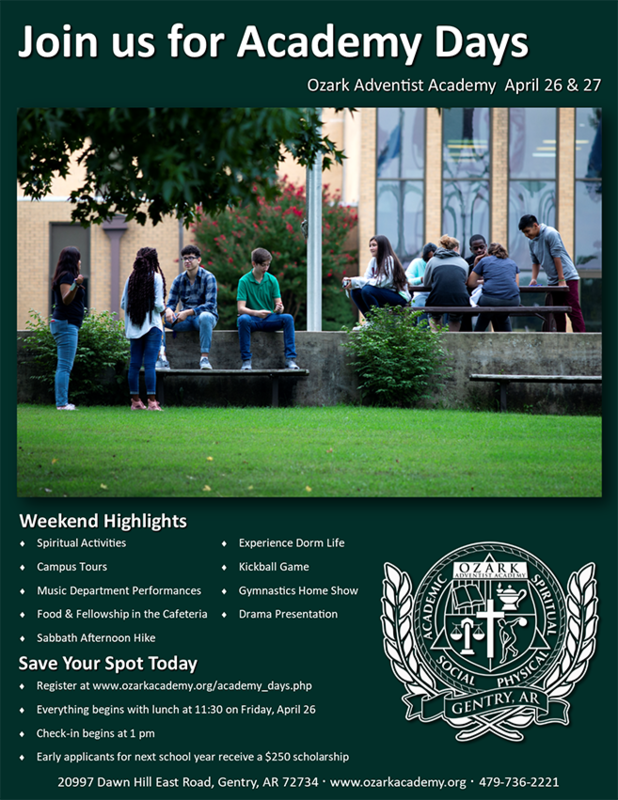 Students in Grades 8-11 are invited to come to Academy Days. Plan to spend the entire weekend on campus to receive the full benefits of the weekend. All Academy Day Guests should come with an adult sponsor. Sponsors are responsible for making sure students attend required meetings and are in the dorm in the evening. Guest Rooms have a queen size bed with linens and private bath available for $45 per night. (There is no charge for all other dorm lodging.) These are limited and should be reserved in advance by calling 479-736-2221 Ext. 304. Sponsors and student visitors should plan to bring a sleeping bag, pillow, towel, and personal items. Academy Days begins with lunch on Friday at 11:30 am and Registration at 1:00 pm. The last event will end Saturday night at 10:00 pm. Visitors who do not live in the area are welcome to stay through brunch Sunday morning.